If you have never listened to a DragonForce album, you can’t go wrong with any of their releases but this, their second disc of power/prog metal, is a fantastic sophomore effort and a good jumping on point for new fans. The overall sound is much more mature over their first album yet is still filled with the lightning fast riffage which is the DragonForce trademark. The production in general is tighter throughout and the mix feels much fuller with even more of the bottom end burbling up through the sonic assault of the guitars and drums. The song writing is still in a fantasy world of swords and warriors but the lyric writing has improved into a wider range of meaning and depth. Listening to this album’s predecessor and then this one, the listener will be able to hear a young and energetic band growing into something bigger with each song. The slower, low string open belies what lurks beneath when this song kicks in. The first thing you will notice is in fact the much better mix of the vocals of ZP Threat on this opening salvo. While his voice was never really drowned out by the sonic assault of the band on their debut disc, he does get a better spot in the overall sound on this one right from song one. There is a reason this song is consistently either number one or in the top five on the iTunes Top Songs Downloaded from DragonForce. Actually it's a combination of reasons: speed, power, majesty, melody and some of the band’s best songwriting to date. I challenge you to get your ears melted by DragonForce with this song if you have never heard them before. The speed of this one is not quite so breakneck throughout, with appropriate down shifts during the bridge. The six-string assault led by Herman Li is an aspiring guitarist’s fantasy come to life. You can almost hear the frets wailing in agony/pleasure as the fingers of a true master dance their manic way up and down the fret board. Despite the downer title, the message in the lyrics is actually quite uplifting in nature. That is a recurring theme of the band’s music and titles. Dark and foreboding song titles with lyrics and delivery which are just the opposite in many regards. Again the vocals and especially the keys get a much better place in the mix. The guitar parts are vintage speed metal palm mutes played with force. At the three minute mark a wonderful departure in the form of a synth solo leads into a blazing guitar lead/synth duel. When DragonForce decide to slow things down a bit, they do it with no less power and majesty than their full bore metal attack. 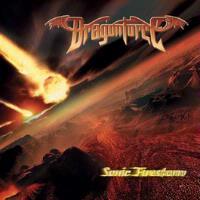 The piano and voice intro are quickly accompanied by the rest of the band in power metal ballad riffage which is as much a part of DragonForce’s signature as their full speed metal. Cool synths and a cooler guitar-synth sounding riff lead the listener into this next piece which quickly explodes into full DragonForce speed metal glory. The fantastically mixed keys throughout this song give it an even fuller sound (as if the band really needed to make their sound any more full). The number shifts speed to slower paced passages and back to top speed in an effortless fashion. At the midpoint in the cut an acoustic guitar and synth led bridge section changes the tone completely but is quickly joined by a crunchy rhythm guitar and a following lead that is among the best which the band has committed to disc yet. This is my personal favorite tune on this album. Yesssssssss, a nine minute plus number. Solo vocals kick things off but are quickly joined by the axe-wielding duo of Herman Li and Sam Totman who play with such speed and accuracy that one would think the whole thing is somehow sequenced together. That is one of the best things about listening to DragonForce: the realization these are real people playing real instruments in truly super human sounding ways. Any mere mortal can play fast. To play fast with melody, energy and heart is all together different. The midpoint of the song does slow down a bit to a galloping riff which Iron Maiden fans will appreciate. A recurring theme in the arrangements on this second disc from the band is the quieter, slower mid-sections. This track is no exception. Considering the title and subject matter, one might not expect the mellow middle sections with their shimmering keys and slower played (by DragonForce standards) trading guitar solos. This actually is a nice breather for the listener who may want to catch their breath from the frenetic pace of many of their songs. It also gives the musicians a chance to stretch a bit and emote more after long runs of melodic speed metal. The slower paced intro of this song quickly jumps to turbo fueled by a quad kick drum. There are hints of past glories of their first album present in the arrangement at the outset, but this quickly shifts into one of the more original sounding numbers on this album. Some truly fantastic key fills throughout are delivered by Vadim Pruzhanov, proving that synths have a very real place in heavy metal despite what others have said about this same subject in metal’s past.